Gastrointestinal harm, known to occur with NSAIDs, is thought to be lower with NSAID and gastroprotective agent, and with inhibitors selective to cyclooxygenase-2 (coxibs) at usual plasma concentrations. We examine competing strategies for available evidence of reduced gastrointestinal bleeding in clinical trials and combine this evidence with evidence from clinical practice on whether the strategies work in the real world, whether guidance on appropriate prescribing is followed, and whether patients adhere to the strategies. We used a series of systematic literature searches to find full publications of relevant studies for evidence about the efficacy of these different gastroprotection strategies in clinical trials, and for evidence that they worked and were adhered to in clinical practice – whether they were effective. We chose to use good quality systematic reviews and meta-analyses when they were available. Evidence of efficacy of coxibs compared to NSAIDs for upper gastrointestinal bleeding was strong, with consistent reductions in events of about 50% in large randomised trials (34,460 patients), meta-analyses of randomised trials (52,474 patients), and large observational studies in clinical practice (3,093 bleeding events). Evidence on the efficacy of NSAID plus gastroprotection with acid suppressants (proton pump inhibitors, PPIs, and histamine antagonists, H2As) was based mainly on the surrogate measure of endoscopic ulcers. The limited information on damage to the bowel suggested that NSAID plus PPI was more damaging than coxibs. Eleven observational studies studied 1.6 million patients, of whom 911,000 were NSAID users, and showed that 76% (range 65% to 90%) of patients with at least one gastrointestinal risk factor received no prescription for gastroprotective agent with an NSAID. The exception was a cohort of US veterans with previous gastrointestinal bleeding, where 75% had gastroprotection with an NSAID. When gastroprotection was prescribed, it was often described as inadequate. A single study suggested that patient adherence to prescribed gastroprotection was low. Evidence for efficacy of gastroprotection strategies with NSAIDs is limited. In clinical practice few patients who need gastroprotection get it, and those who get it may not take it. For coxibs, gastroprotection is inherent, although probably not complete. Chronic pain affects one adult in five in Europe , limits functioning, and is an enormous problem for healthcare. Osteoarthritis, rheumatoid arthritis, and back pain have the largest negative impact on quality of life of any chronic condition (including cancer, chronic respiratory conditions, or heart disease) for people living in the community . NSAIDs are effective analgesic and anti-inflammatory drugs that form the main pharmacological approach to treating various forms of pain, and particularly chronic musculoskeletal pain, but have a number of known adverse effects. NSAIDs (and aspirin) are associated with upper  and lower [4–6] gastrointestinal harm, acute renal failure [7, 8] and congestive heart failure [9, 10]. Coxibs are differentiated pharmacologically from traditional NSAIDs by inhibiting only the cyclooxygenase-2 enzyme, and clinically by lower rates of upper and lower gastrointestinal harm. All of these drugs (aspirin, NSAIDs, and coxibs) may also be associated with increased risk of cardiovascular harm, although increased cardiovascular events are not generally seen for coxibs compared with NSAIDs or placebo in studies in patients with arthritis. Meta-analyses of large numbers of patients in trials of individual coxibs  and all coxibs  found no systematic difference between coxib and NSAID. Meta-analysis of recent observational studies with 3.5 million patients showed that cardiovascular effects of some NSAIDs (particularly diclofenac) were greater than some coxibs . Our views on rare but serious harm can be directed by the amount of information available. This paper concentrates on differences between NSAIDs and coxibs for causing gastrointestinal harm. Possible strategies for reducing gastrointestinal harm from NSAIDs alone include use of coxib, NSAID plus PPI, NSAID plus H2A, or NSAID plus misoprostol. Since misoprostol is prescribed rarely in the UK  and elsewhere because of other gastrointestinal adverse events it causes, the competing strategies for gastroprotection are use of histamine antagonists or proton pump inhibitors with NSAID, or coxib. The effectiveness of any strategy is the product of efficacy in clinical trials, and the usability of the strategy in clinical practice. For drugs, this means that prescribing of a medicine is appropriate, and that patients prescribed the medicine take it. Medicines not taken cannot be effective. We examine each competing strategy in terms of available evidence for reduction of gastrointestinal bleeding in clinical studies and combine it with evidence from clinical practice on whether the strategies work in the real world, whether guidance on appropriate prescribing is followed, and whether patients are able or willing to adhere to the strategies over the longer term. 1. Evidence of reduction of upper and lower gastrointestinal bleeding rates with coxibs compared with non-selective NSAIDs; in particular, evidence that results obtained from clinical trials were also seen in clinical practice. 2. Evidence concerning levels of prescribing of gastroprotective strategies with non-selective NSAIDs to patients with one or more risk factors for gastrointestinal bleeding, and whether prescribing was described as appropriate against any prescribing guidance. 3. Evidence concerning adherence to prescribed gastroprotective strategies with non-selective NSAIDs. A number of different search strategies were used to find full publications of studies relating to these outcomes. These were predominantly free-text searches of PubMed and the Cochrane Library (to December 2005), bibliographies of papers and reviews, and discussions with experts. Where evidence was available, we chose the highest level available, preferably from good quality systematic reviews and meta-analyses. The sensitivity of electronic databases for observational studies is known not to be high [15, 16], so reviews and bibliographies were extensively searched for references to studies of prescribing strategies in clinical practice. Any study that might have contributed was obtained in full and read. For inclusion, the only criterion was that of full publication; abstracts or posters were not accepted. Formal quality scoring of included studies was not considered appropriate because of the likely mix of systematic reviews, randomised trials, and observational studies. The review was considered to be a descriptive narrative review, without extensive pooling of data. No statistical methods were planned, and none used. Table 1 summarises evidence relating to the outcomes of complicated upper gastrointestinal bleeding and/or symptomatic ulcer from three large randomised trials powered to detect these events (34,460 patients; [17–19]), and six meta-analyses of randomised double blind trials (52,474 patients in total, 44,415 of whom were not in one of the large randomised trials; [20–25]). Some of the meta-analyses include information from the large randomised trials, with some inevitable, but limited, duplication. The number of events was as low as 11 in one meta-analysis  and as high as 283 in one large randomised trial . Whether the outcome was complicated bleeding events, symptomatic ulcers, or the combination, the rate with coxibs was consistently about half that with NSAIDs. In randomised trials, coxibs had significantly lower rates for upper gastrointestinal bleeding, symptomatic ulcers, endoscopic ulcers, anaemia, and withdrawal due to gastrointestinal symptoms (Table 2). For endoscopic ulcers, benefits for coxib over NSAID were of the same absolute magnitude (number needed to prevent 8) with or without low dose aspirin . Three large observational studies [26–28] with 3,093 bleeding events compared NSAIDs and coxibs in clinical practice (Table 1). Each of these studies noted that patients receiving coxibs had more gastrointestinal risk factors than those receiving NSAIDs (channelling bias), and adjusted risk estimates for this confounding. Each of them used the outcome of hospital admission for gastrointestinal bleeding, usually upper gastrointestinal bleeding. The number of events with particular treatments could be low; only 17 admissions occurred with NSAID in one , and only four with coxibs in another . Despite the relative paucity of events, the risk of hospital admission with coxib was about half that with NSAID. Clinical practice produced the same magnitude of reduction for coxib compared with NSAID as did clinical trials. Lower gastrointestinal bleeding has not been extensively studied. In the 1990s, using radioactive indium-labelled white cells, it was shown that faecal excretion of white cells (a marker of intestinal inflammation) was elevated with oral NSAID. Calprotectin, a calcium binding protein found in neutrophilic granulocytes, monocytes, and macrophages, which resists faecal degradation was also used as a marker. Use of the test in 312 patients taking NSAIDs showed that 44% had raised faecal calprotectin concentrations, much the same as estimates with indium studies . A retrospective analysis of a large (8,000 patient) randomised trial comparing daily rofecoxib 50 mg with naproxen 1000 mg used three markers for lower gastrointestinal bleeding (gross rectal bleeding with haemoglobin decrease of 20 g/L or admission; haemoglobin decrease, positive faecal blood, no upper gastrointestinal bleeding; admission for lower perforation, obstruction, ulceration or diverticulitis) . It showed a significant reduction of these events (by about 50%) with coxib compared with NSAID, and that lower gastrointestinal bleeding was about 40% of total (upper plus lower) gastrointestinal bleeding events. A more recent randomised trial  compared celecoxib 400 mg daily with placebo and naproxen 1000 mg plus omeprazole 20 mg daily, in 360 healthy volunteers over two weeks. Capsule endoscopy found significantly more small bowel mucosal breaks per patient with celecoxib (0.3 breaks per patient on average) than with placebo (0.1), but many more with naproxen plus omeprazole (3.0). Another marker of blood loss from the bowel may be anaemia. Oral diclofenac 150 mg daily produced anaemia in 10% of about 310 patients in 12 weeks . Hooper et al  noted a significantly lower rate of anaemia with coxibs compared with NSAIDs (Table 2). A large meta-analysis of celecoxib trials using clinical trial reports to ascertain adverse events used two markers of anaemia, a haemoglobin fall of ≥ 20 g/L, or a haematocrit fall of ≥ 5% by the end of the study . Celecoxib and placebo were not significantly different, while rates with celecoxib were always lower than those with NSAID, with numbers needed to prevent one case of 92 and 18 for haemoglobin and haematocrit respectively compared with NSAID. Only three upper gastrointestinal bleeds were noted in a meta-analysis of randomised trials using NSAID plus PPI vs NSAID alone (; Table 2), and only 18 symptomatic ulcers. NSAIDs plus PPI had lower rates of endoscopic ulcer and withdrawal due to gastrointestinal symptoms, though with only 48 events for the latter calculation (Table 2). Two randomised trials [32, 33] have directly compared celecoxib 200 or 400 mg daily with NSAID plus PPI (diclofenac 150 mg plus omeprazole 20 mg daily, or naproxen 750 mg plus lanzoprazole 30 mg daily). Both were conducted in patients with a previous ulcer bleed, and who needed NSAID for arthritis. After ulcer healing, patients were randomised to treatments over six months. Serious gastrointestinal complications (bleeding events) were no different for celecoxib than NSAID plus PPI (4.2% vs 6.0%; relative risk 0.7, 95% confidence interval 0.3 to 1.5). There were similar rates of discontinuations due to adverse events (4.5% vs 3.8%; relative risk 1.2, 0.5 to 2.8), but dyspepsia was significantly more common with coxib than NSAID plus PPI (15% vs 7%; relative risk 2.1, 1.3 to 3.6). Lower gastrointestinal mucosal breaks were more common with naproxen plus omeprazole than coxib or placebo . Two observational studies using capsule endoscopy also found high levels of small bowel injury taking diclofenac 150 mg plus omeprazole 40 mg daily in volunteers  and in patients with NSAID use for three months or more plus some form of gastroprotection . The only evidence for efficacy for histamine antagonists with NSAID was for endoscopic ulcers (Table 2). There was no evidence of efficacy for histamine antagonists protecting against lower bowel injury. We found 11 studies related to the appropriateness of use of gastroprotective strategies in patients using NSAIDs [36–46] (Table 3). These studies included 1.56 million patients, of whom 911,000 were recipients of NSAIDs. Recommended gastroprotection in 9% of patients with one risk factor, 11% of those with two risk factors. Most patients had no gastroprotection, whilst about 25% had inadequate gastroprotection. 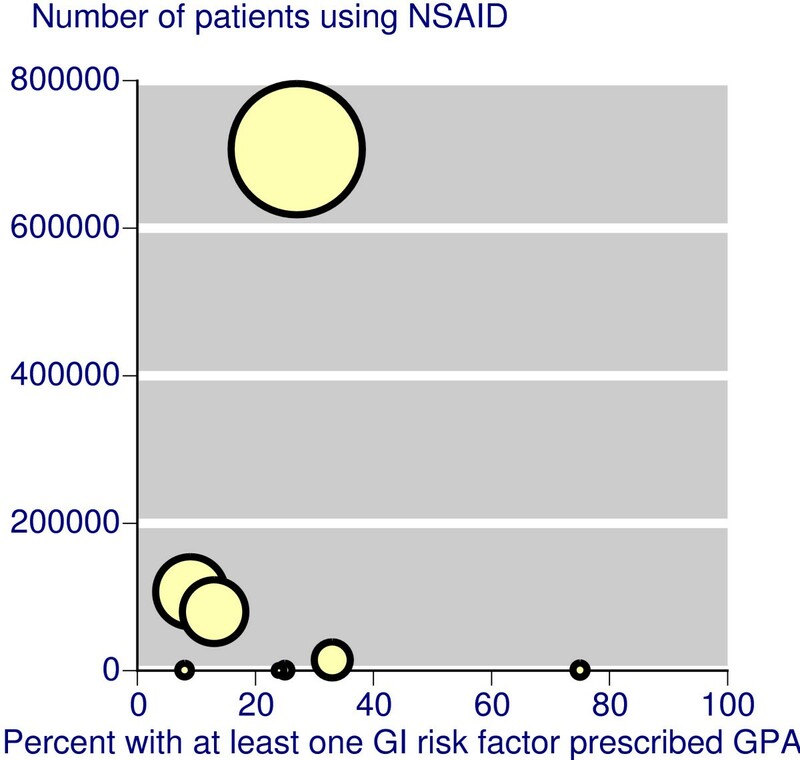 One or more gastroprotective strategies used in 43% of NSAID users. In 1.4 million chronic users, the mean prescription was for 67 days supply. Eight of the 11 studies reported that large proportions of patients with gastrointestinal risk factors (including age ≥ 65 years) were not receiving appropriate gastroprotection. In what appeared to be mainly primary care populations, non-use of gastroprotection in patients with at least one gastrointestinal risk factor was about 73% to 90% in the USA [37, 44], 76% in Italy , 87% in Holland , 65% in Canada , and 76% in the UK . A study in secondary care in the UK found no gastroprotection in 76% of patients with at least one gastrointestinal risk factor , but gastroprotection non-use was lower at 25% in a cohort of patients following a diagnosed ulcer or bleed . Pooling these 11 studies (Figure 1), 76% of the patients with at least one gastrointestinal risk factor did not receive a prescription for a gastroprotective agent. Scatter plot showing the percentage of patients with at least one gastrointestinal risk factor prescribed an NSAID plus gastroprotective agent (H2A or PPI) or a coxib. The size of the symbol is proportional to the size of the study. Four of the 11 studies made some comment on the adequacy or appropriateness of prescribing of NSAIDs and coxibs, with or without gastroprotection. It was not always clear what specific guidelines were used to judge appropriateness, and results varied greatly. Two Dutch studies [36, 42] agreed on the adequacy of gastroprotection, at 55% and 65% respectively. Both defined inadequate prescribing as a lower dose H2A. In Canada prescribing was deemed appropriate in 33% of patients with no risk factors, and in 74% of those with at least one risk factor . By contrast, in UK secondary care only 8% of NSAID users were deemed to have appropriate treatment , and of those prescribed gastroprotection, 56% were prescribed PPI, without comment on whether doses of other gastroprotective agents were effective. Three studies [36, 43, 45] commented on factors associated with a higher propensity to be prescribed gastroprotection. Consistently mentioned were having two or more risk factors, older age, and history of prior bleeding. Three further studies [47–49] (Table 1) confirmed that gastroprotection was not used in about 80% of NSAID users, while not providing information about risk factors. We could find only a single study examining adherence to gastroprotection. Sturkenboom et al  followed 784 patients receiving PPI or H2A with NSAID. Half the users of H2A had become non-adherent after about 100 days, rising to about 70% by a year. Adherence was better with PPI, but non-adherence was about 40% by a year, and had risen to about 60% by the longest follow up of two years. In a cohort of 711 subjects who stopped their NSAID and who were followed up for up to two years , about 40% had at least one additional prescription for acid suppressing medicine after stopping NSAID, and somehat more than 30% had at least two prescriptions. Current UK clinical guidance on NSAID use  includes the following risk factors for developing an NSAID-induced gastrointestinal adverse event. • Age of 65 years and over. • Previous history of gastroduodenal ulcer, gastrointestinal bleeding, or gastroduodenal perforation. • Concomitant use of medications that are known to increase the likelihood of upper-gastrointestinal adverse events (anticoagulants, aspirin, including low-dose aspirin, and corticosteroids). • Presence of serious comorbidity, such as cardiovascular disease, renal or hepatic impairment, diabetes, or hypertension. • Requirement for a prolonged duration of NSAID use. • Use of the maximum recommended doses of NSAIDs. • The presence of Helicobacter pylori infection. Using these criteria, many NSAID users have a risk factor, even if it is only age. A large US study found that 42% of 707,000 NSAID users were at higher risk , and in a recent Italian study at least one risk factor was found in 68% of NSAID users . Many different guidelines exist, and they consistently recommend use of gastroprotective agent (PPI or H2A) with NSAID, or use of coxib. All strategies include interventions that should precede oral NSAID use, such as lifestyle change, topical NSAIDs, paracetamol, and glucosamine; this study did not include any of these, as they are not conventionally implicated in gastrointestinal damage. This review set out to examine the strength of evidence on particular gastroprotective strategies, whether guidance about strategies was implemented by prescribers, and whether patients were adherent to prescribed medicines. The evidence available is mixed: some points are addressed by large and coherent amounts of evidence, while for others evidence is either lacking or limited. An important limitation is that much of the information, especially in observational studies in clinical practice, does not differentiate between different NSAIDs or gastroprotective agents. Moreover, while some evidence is of the highest level from meta-analyses of high-quality randomised trials , other evidence is from observational studies, where testing of quality is more difficult. We do know, however, that when criteria of quality, validity, and size are met, observational studies produce similar results to randomised trials . The evidence on efficacy in reducing upper gastrointestinal bleeding is considerable for coxibs. Three adequately-powered randomised trials, and several meta-analyses of large numbers of patients in randomised trials come to the consistent conclusion that the rate of complicated upper gastrointestinal events with coxibs is about half that with NSAIDs. Rates of symptomatic ulcers, endoscopic ulcers, and withdrawal because of gastrointestinal adverse events were all about half with coxibs compared with NSAIDs. For coxibs there is also evidence, from capsule endoscopy studies, of reduced lower bowel damage compared with NSAID plus PPI. Additionally, rates of anaemia were lower with coxibs than with NSAIDs in two large meta-analyses [24, 25], using several definitions of anaemia. This represents a large body of evidence, with many events (Table 2), using clinical as well as surrogate outcomes, and supported by large observational studies of high quality. Strategies of co-prescription of NSAID with either PPI or H2A do not have this degree of evidence to support reduction of serious gastrointestinal complications. One reason for is that this indication came considerably later than original licensing of these gastroprotective agents and the surrogate marker of endoscopic ulcers was used. Absence of large outcome trials does not mean that they do not work, and we have no direct comparisons of different strategies in large numbers of patients with clinical events as outcomes. Even combined, randomised trials of these strategies had only four clinical events, and only the surrogate marker of endoscopic ulcer supports efficacy. Because we have two direct comparisons of coxib with NSAID plus PPI in two randomised trials in high-risk patients immediately after healing of a previous ulcer, and with no statistically significant difference, we can probably assume at least some degree of upper gastrointestinal protection with PPI use, although conclusions from these trials may not apply to those without a previous ulcer. For H2A, no such assumption is justified. We have evidence from one large randomised trial and two cohort studies that coxibs cause fewer problems in the lower bowel than NSAID and PPI. Use of NSAID plus PPI, and especially H2A, therefore fall some way short in terms of gastrointestinal protection. The evidence from observational studies is that most patients at higher risk of gastrointestinal problems with NSAIDs, by virtue of age or previous history, are not usually given gastroprotection. Most of the studies relate to the period 2000–2002, and it may be that the introduction of better guidance since then has led to a change, but we could not find evidence of that. Two further studies published in 2006 confirm low use of gastroprotection in patients with gastrointestinal risk factors taking NSAIDs. One in primary care  reported a large uptake of coxibs over 1998–2002, and low use of gastroprotection with NSAIDs at any time over that period in patients aged 65 years or older. The second  surveyed prescribing by rheumatology specialists in 2003/4, and found that even in patients with four risk factors for gastrointestinal ulceration, gastroprotection was co-prescribed with NSAIDs in no more than 40% of patients. The evidence we have about prescribing is that guidance has not generally been followed: three quarters of patients with at least one gastrointestinal risk factor did not receive a prescription for a gastroprotective agent. In individual studies in primary care adherence prescribing guidelines varied from 9% to 27% (Figure 1). It should be emphasised that this observational evidence is substantial, based on almost 1.6 million patients, over 900,000 of whom were prescribed NSAIDs, and studies often specifically tested adherence to evidence-based guidelines (as in over 700,000 patients ). Patient adherence to prescribed gastroprotection was described in only one study , which found that adherence to NSAID plus PPI or H2A declined rapidly, so that after about six months the majority of patients were not taking the gastroprotection prescribed. This is in accord with many other studies of adherence to medicines. Adherence to low dose aspirin was only 47% after a year , was as low as 33% for statin and antihypertensive medicines when prescribed together , and was even about 20% with immunosuppressants following renal transplantation . Coxibs cause less gastrointestinal harm, thus limiting or eliminating the need for co-prescription and the problem of adherence. We chose not to extend this review beyond the narrow bound of gastroprotection, but other issues are important. For instance, NSAID and coxib clinical trials have a range of common adverse events . Other serious adverse events, like cardiovascular problems, have to be considered, and it seems increasingly likely that these will be related to individual NSAIDs or coxibs rather than coxibs versus NSAIDs [12, 13]. Long-term acid suppression itself may be associated with adverse events, including hip fracture  and vertebral fracture . Patient choice is an increasingly important issue, and interestingly no experienced patient with knee osteoarthritis chose conventional NSAID therapy when presented with information about common therapies . In this review the use of observational studies to evaluate adherence to clinical guidelines is not a limitation: the observational studies report what is happening in clinical practice. Moreover, many of these observational studies were large and inclusive, minimising potential for bias. Evidence from clinical trials (randomised, and controlled) and clinical practice (observational studies) tend to be similar when criteria of quality, validity and size are met . It is seen for cardiovascular effects of coxibs and NSAIDs in meta-analyses of clinical trials  and observational studies . For a strategy to be effective, it has to translate efficacy from clinical trials to clinical practice. With NSAIDs, but not coxibs, gastrointestinal protection can be delivered only if those patients who need gastroprotection are given it, and those who are given gastroprotection take it. Effectiveness evidence is summarised for the different strategies is in Table 4. The evidence for efficacy of co-prescription of gastroprotective agents in protecting the upper gastrointestinal tract is largely limited to the surrogate measure of endoscopic ulcers, though it is probable that bleeding events would be reduced. Such evidence we have suggests that PPIs have no efficacy in protecting the small bowel. From clinical practice, the evidence is that those patients who need gastroprotection do not get it, while those who get it do not take it. As a strategy, this is a considerable way short of ideal. Summarised from Hooper et al, 2004 . There is considerable evidence that patients who need gastroprotection because they have at least one gastrointestinal risk factor do not get it, despite clear guidelines suggesting that they should. There is limited evidence that those who get gastroprotection in the form of PPI or H2A do not take it. As a strategy, this is a considerable way short of ideal. Pain Research is supported in part by the Oxford Pain Research Trust, and this work was also supported by an unrestricted educational grant from Pfizer Ltd. Neither organisation had any role in design, planning, execution of the study, or in writing the manuscript. The terms of the financial support from Pfizer included freedom for authors to reach their own conclusions, and an absolute right to publish the results of their research, irrespective of any conclusions reached. Pfizer did have the right to view the final manuscript before publication, and did so. RAM, HJM and CP have received consulting and/or lecture fees from pharmaceutical companies and other organisations. The authors have received research support from charities and government sources at various times. No author has any direct stock holding in any pharmaceutical company. RAM was involved with the original concept, planning the study, data extraction, analysis, and preparing a manuscript; SD with data extraction, analysis, and writing; CP and HJM with writing and advice. All authors read and approved the final manuscript.